Want to fill the void in your life until Modern Family returns? 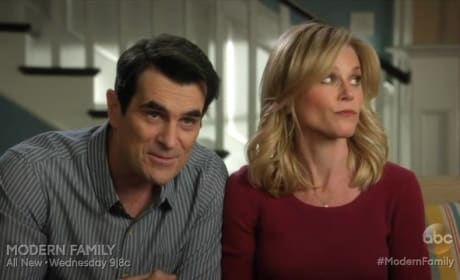 TV Fanatic has an exclusive deleted scene from Modern Family Season 8! Check it out! 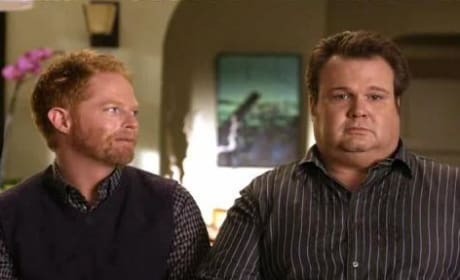 This Modern Family sneak peek is all about Phil. Why is he wearing a tuxedo? Watch and find out! James Marsden lands in Cam and Mitchell's hot tub on the Modern Family episode "Slow Down Your Neighbors." Watch the pair ogle the actor in this hilarious clip. Modern Family returns with new episodes on September 22. Prepare to laugh uproariously with this sneak peek at season two. It's off to Hawaii for Jay's birthday! It's just gonna be him, Gloria... and the entire family. Jay receives that news in this clip from "Airport." Modern Family aired this hilarious commercial during the Academy Awards telecast. If you aren't watching this sitcom, you really should. Much to Mitchell's disappointment, Cameron breaks out his old clown costume by dressing as Fizbo. In this hilarious clip from "Fizbo," Cameron dresses as a clown named Fizbo and annoys Jay while scaring Phil. By the way, do not look up peeing games on the internet. Permalink: By the way, do not look up peeing games on the internet.